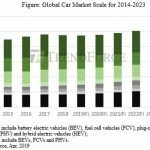 Despite a number of unfavorable policy announcements, the PV market still added 101 GW in 2018; and it looks likely that this momentum will continue this year, with as much as 110 GW of new capacity being added. As demand strengthens, we expect to see diversification, with the number of GW-scale markets increasing from six in 2016 to 16 in 2019, while the total market share of the top five markets combined will decrease from 81.4% to 65%. In contrast to the diversifying market, supply chains continue to concentrate in Asia. 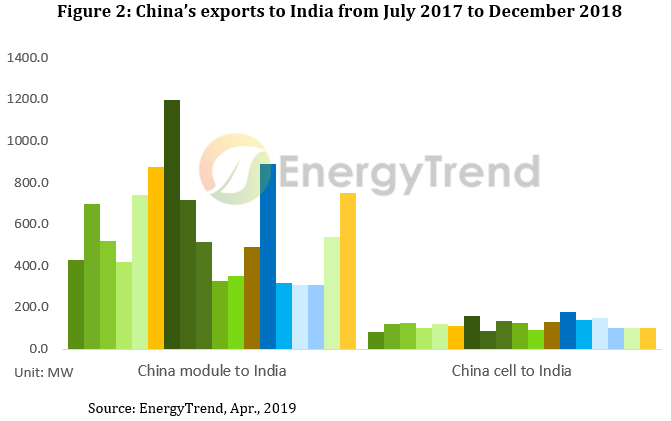 According to EnergyTrend’s database, China accounted for 69% and 64% of global cell and module capacities, respectively, while the whole Asian region (excluding India) accounted for 92% and 85%, respectively. Further analysis on supply and demand of the major markets in 2019 shows that China, Southeast Asia, Taiwan and Korea are all regions of oversupply, while the United States, India and European countries rely on imports from these countries to meet the demands of their markets. Since 2012, trade barriers have had a constant impact on the solar industry’s iinternational trade relations. Last year saw further dramatic changes, including the United State’s Section 201 and Section 301 actions, India’s safeguard tariffs, and the elimination of Europe’s Minimum Import Price (MIP), causing the market outlook to remain murky. No limitations are imposed on exports or imports in countries that don’t raise trade barriers, such as Australia, Japan and Southeast Asian countries. Purchasers in these markets prioritize aspects, such as price-performance ratios, brands and warranties, and power quality. China’s tier-1 brands hold the greatest advantage in these aspects. India introduced a safeguard tariff on July 26, 2018. However, China’s export data shows that although India’s demand reached a low point due to its shifting policies between August and October, imports made a clear recovery from November onwards. There is still a demand side gap in India’s market, and China’s multi-Si module prices still manage to stay below US$0.29/W after applying the tariff, proving India’s safeguard duty to be defensively deficient. 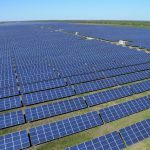 Only the tariff-free modules from Vietnam and Thailand have a chance to compete with tariffed Chinese modules. 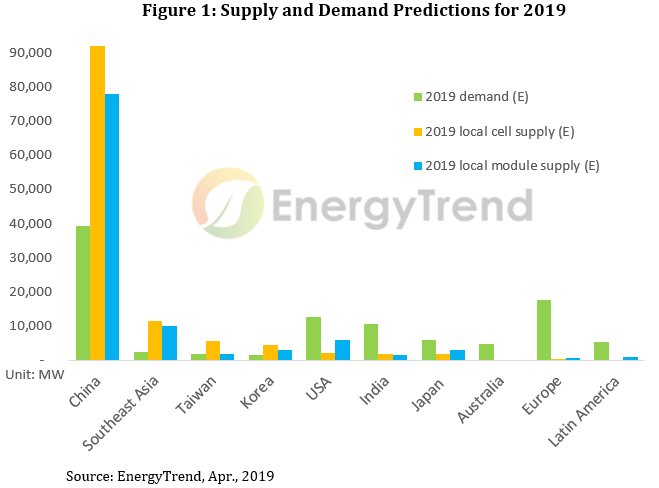 Another case: The United States, which has domestic capacities of 2.5 GW for cells and 6.6 GW for modules, still requires a further 10 GW and 5.9 GW in exports, respectively, to satisfy the estimated 12.5 GW of demand in 2019. Although products from Turkey, India and certain countries are completely tariff-free, they are limited in capacities and price-performances in contrast with mainstream Asian vendors. This means the United States will definitely import products from Asia: After the annual 2.5 GW tariff-free quota has been consumed, tariffed products will have to be imported. By analysis of cell prices in Taiwan, Mainland China and Southeast Asia, the most competitive products are Southeast Asian cells assembled into modules in the United States, as shown by the blue line in Figure 3. Those assembled in Southeast Asia and directly shipped to the United States come second. Mainland China and Taiwan are still covered by the anti-dumping and countervailing duties (AD/CVD) imposed by the United States. Taiwanese companies currently have combined tax rates between 26.33 – 49.5%, while China’s capacity has combined tax rates between 62.24–286.59%. Since Taiwanese products are priced higher, their after-tax prices are nearly on par with China’s (calculated by the lowest tax rate). 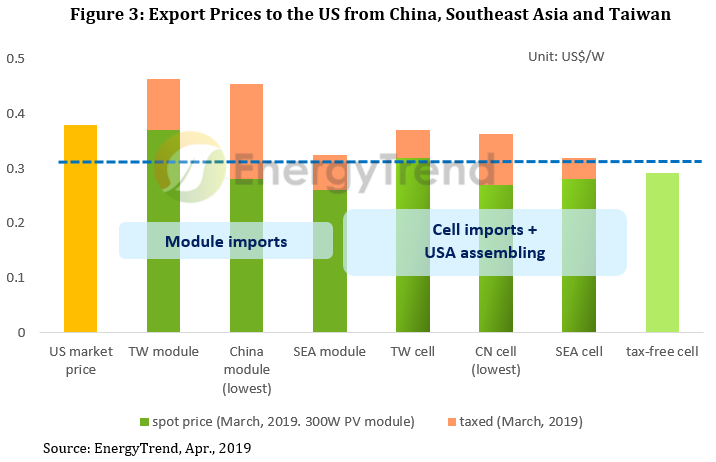 However, Taiwan’s exports toward the United States consist mainly of cells, while China’s consist mostly of PV modules; both countries don’t compete with each other directly, but primarily with Southeast Asian capacities in cells and in module sectors, respectively. Apart from the previous two modes of export, trade barriers may also result in supply replacement and crowding. For example, India’s safeguard tariffs block Malaysian capacity. If this causes a gap in supply, this may be filled by capacities from neighboring and tariff-free Vietnam and Thailand, or even China, where prices still remain low, even after applying tariffs. Crowding, on the other hand, is most pronounced in Europe. China’s product prices have been falling since the "May 31 Policy”. Europe’s MIP ended on September 3, 2018, so China’s products became extremely competitive in the European market once again. The market share of Made in China products grew to over 50% in October 2018, clearly crowding out those from Taiwan, Korea and Southeast Asian regions. Different places of origin have different limits, along with differing production costs and spot prices. As the supply chain experienced dramatic price drops – beginning in the second half of 2018 – product flows became turbulent across the globe under the various trade barrier strengths of each country. Therefore, China’s products now dominate the global market, due to their competitive price-performance ratios. Taiwan focuses on cell exports with rather high production costs and less competitive prices, thus threatening its range of export markets. By comparison, Southeast Asian production capacities have the advantage of lower production costs, steady supply and a larger selection of export markets. Possessing the highest flexibility in supply, Southeast Asian manufacturers can adjust shipment flows according to real market situations, even in regions with trade barriers.